Schizophrenia is a complex human disease, caused both by individual genetic variation and lifestyle. Genome-wide association studies have implicated many molecular targets and biological pathways with this disease. One these pathways associated with schizophrenia is the so-called Neuregulin1 (Nrg1)-ERBB4 signaling pathway. 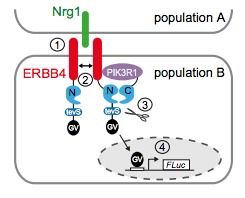 Nrg1 is the ligand for the ERBB4, which is a membrane-spanning receptor, and therefore represents a prime druggable target. Increased levels of Nrg1‐ERBB4 signaling are associated with schizophrenia and corresponding mouse models display endophenotypes of the disease. In this work, SYSTASY have performed a drug repurposing screen to identify compounds that inhibit Nrg1‐ERBB4 signaling. The NIH clinical collection of approved drugs was screened for repurposing these drugs. To screen for chemical modulators of Nrg1‐ERBB4, SYSTASY has developed a NRG1‐ERBB4 pathway‐selective cell‐based co‐culture assay using its proprietary splitSENSOR technology. The mineralo‐corticoid antagonist spironolactone was recovered from the screen to inhibit Nrg1‐ERBB4 signaling. SYSTASY’s collaborators at the clinics of Psychiatry and Psychotherapy of the University Hospital of the LMU Munich have validated spironolactone as ERBB4 inhibitor, as the drug decreases phospho‐ERBB4 levels in cell culture and in vivo. Furthermore, LMU collaborators showed that spironolactone improved schizophrenia‐relevant phenotypes in Nrg1‐transgenic mice, as chronic spironolactone treatment improved aspects of cognitive and positive symptoms of schizophrenia‐relevant phenotypes in this mouse model. Spironolactone is an antagonist of NRG1-ERBB4 signaling and schizophrenia-relevant endophenotypes in mice.